Parents know that education is a crucial enabler in the modern world which may give their children skills that are essential in later life. 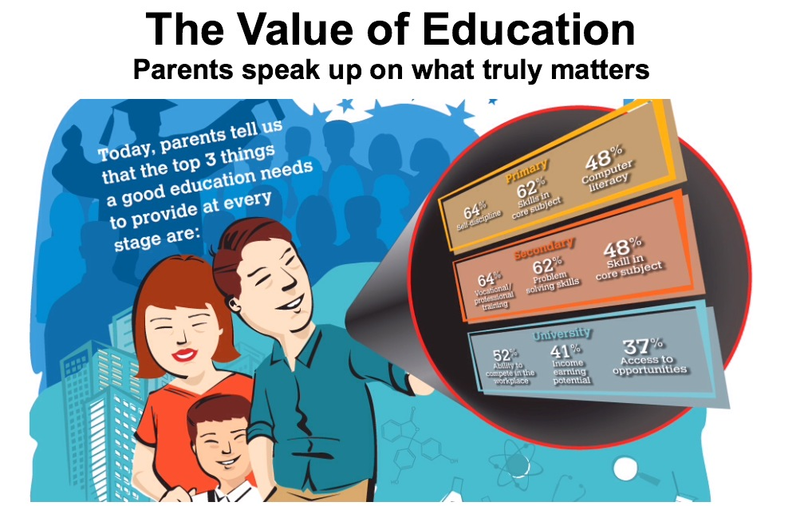 Knowing its importance, HSBC Group commissioned a global survey across 15 countries themed “The Value of Education” to canvass the hopes and aspirations of parents with regards to the education of their children. This infographic is a summary of some of the key findings and we hope it will enable you to better understand public sentiments regarding education and the practical steps you may want to take when planning for this rewarding and life-changing path for your child. Here goes! When it comes to education, Malaysian parents’ expectations are always changing as their children progress through the education system. But fewer than one in five parents are open to funding a private primary or secondary education. 2. Where would they like their children to study? Almost half (45%) of parents in Malaysia believe that Malaysia has a better quality education system than the best available abroad. 3. When would Malaysian parents send their children abroad? At what age? 37% At Secondary school age. 37% At University age, 88% of Malaysian parents would consider sending their child abroad to study at university stage. This is higher than the global average of 74%. 4. What do Malaysian parents hope their children gain from an overseas education? 98% of Malaysian parents aspire for their child to go to university while 91% of Malaysian parents would like their child to study at a postgraduate level. 6. How will Malaysian parents make that aspiration come true? 8. Nearly two-thirds (64%) believe that paying for their child’s education is the best investment they can make. Most parents expect to fund their child’s education themselves via various means. Despite this, in Malaysia, more than four in five (84%) parents wish they have started to plan and save earlier for their child’s education. It’s not too late. Start now to plan for your children’s education. 4. Why Not Enjoy The Best of Both Worlds? Is China's HE Strategy Too Narrow to Dominate the World Rankings? Will Higher Education in the 21st Century Belong to China? Can Universities in India and China Be the Education Powerhouses in the 21st Century? China: Education Part of G20 Summit's "Innovative Growth"
Will China's Educational System Strangle Economic Growth? What Impact Does University Reputation Have on Students? Can China Become a Global Leader in HE Innovation? Where is Canada Government Heading on China? Who Tops the Class – 'China Tigers' or 'Western Softies'? Shifts in Foreign Grad Population in U.S.
Why Do Indians Study Abroad? South Korea Students Appetite for Education Changed! Indian students in "China rush"
China the new education hub for Malaysian students! Top 10 most employable majors in China - Will it also influences the world job market trend? Higher Education In Malaysia - Do You Have Alternatives? Is Studying Abroad An Expensive Affair? WHY NOT ENJOY THE BEST OF BOTH WORLDS? Student Education Loan- borrow or not? Is the university you plan to enroll offered wholesome on-campus life? Seek Education Even If It Takes You To China! Is Study Western Medicine in Chinese University - a risk worth taking in Malaysian context? Consolidation time for medical school in Malaysia! Medical Schools In Malaysia - For Better or For Worse? The State of Malaysia's Education - What Lies Ahead? The Fate of a Country Won't Be Decided on a Battlefield, It Will Be Determined in a Classroom! Malaysia's Education - Common Licensing Exam for Medical Grads? Malaysia's Education is on Fire! Singapore Has Done It Again and Again! Is Tertiary Education a Boon or a Bane?